A hard to find side cap design, made all the more interesting with the date of the event printed on it. This version of Fireball is also interesting not just for the side cap designs but internally, each body halve has two supporting ribs. 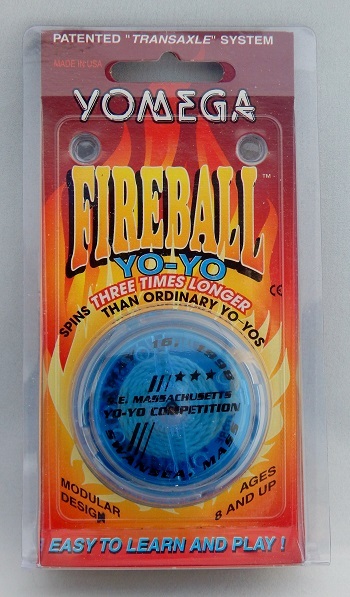 Usually Fireball yo-yos either had no supporting ribs at all, or they had four supporting ribs configured in an X cross. You can see the two support ribs in each halve by viewing either of the two close-up images. As of 2018, the names of those who won 1st, 2nd, and 3rd place in the contest are unknown. Also, the Swansea, Massachusetts store "Funz-A-Poppin'!" that sponsored the contest is either out of business or the store name has changed. Original retail price: $11 US.